Our company is engaged in the manufacturing, supplying and exporting of optimum quality Involute Gear Cutter. 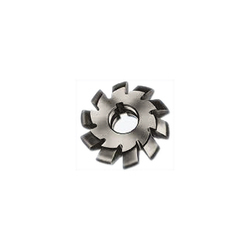 These cutters are manufactured in accordance with international parameters using best quality metals. Highly demanded among the customers, offered gear cutters are acknowledged for their seamless finish, hassle-free installation and corrosion resistance. Involute gear cutters are machine form relieved - the profile remains constant throughout cutter life, provided that on re-shapening, the face of the tooth is ground radial-to-centre. CTI designs and manufactures spur and helical gear shaper cutters to produce all types of internal and external Gears, Splines, Sprockets and Timing Pulleys. Backed by rich industry experience, we have been able to offer our clients high quality range of Gear Shaping Cutter (GSC-03). These are manufactured by the quality raw material. Our product range of gear cutter are offered to cut involute gears, splines and special forms. 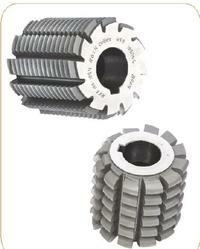 - Gear Shaping Cutters both Disc type, Hub type can be made to qualify all standards. We can supply Shaper Cutters with coating. GM Tools (India) offers a range of Gear Shaper Cutters Disc type designed for producing spur, splines, sprockets and helical gears. Also available are customized shaping cutters to cut pre-shaved, pre-grounded automobile gears with combination of features like protuberance and semi-topping. Gear Shaper Cutters are made for cutting internal & external gears and splines.